Extreme situations are often a good test to know our abilities to make complex decisions. One of the best examples corresponds to managing emergencies in international conflicts, natural disasters, epidemics and nutritional crises. For instance, leadership, communication, strategic vision or teamwork are some of the skills required to respond efficiently to critical and stressful situations. In order to learn from managing humanitarian emergencies, EADA’s masters participants took part in March in the Managing Humanitarian Emergencies course, one of several 24-hour electives that they could choose to complement their training at the business school. The course was open to all types of backgrounds and helped participants to make some choices, as an individual or as member of a company. From professional opportunities, to gain elements to build a corporate social responsibility dossier or to learn about a different managing system in complex settings and contexts. 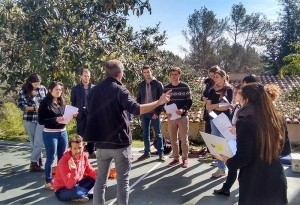 The seminar was designed and delivered by David Noguera, with 15 years working experience in humanitarian aid, EADA’s professor and also co-funder and director at ReAcció Humanitària –institution that organises training, team building and awareness on humanitarian emergencies–. To him, “in a global world and economy, individuals, organisations and corporations are accountable in relation to shared values and hold responsibilities beyond mere financial balances”.